This THP is about 3 miles NE of Big Bend, CA and about a dozen miles NW of Burney, CA at an elevation of 2,600 to 4,600 feet. 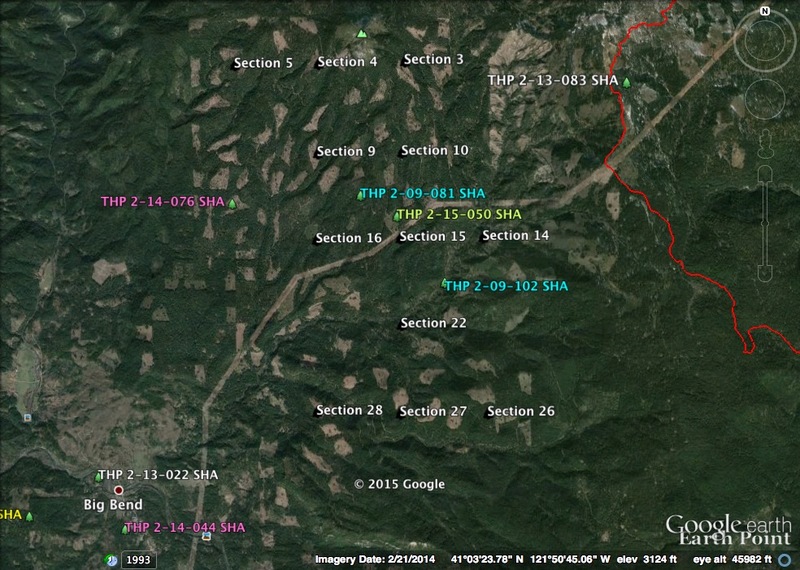 Sierra Pacific Industries is planning a mostly clearcut tractor and cable logging operation on steep and unstable slopes in sugar pine, Douglas fir, white fir, ponderosa pine and incense cedar forests. Ground based equipment is proposed for use in areas designated for cable logging in units 4C, 4D, 5B, 27A, 27B, & 28, and 2 skid roads are proposed for use inside class II (mid sized) watercourses in units 15B and 22B. A new road is also proposed for construction above an unstable headwall swale area in section 3, and tractor logging is proposed around unstable areas in units 22D, 4D, and 5B. Tractors are proposed for use on steep slopes over 50% grade that do not flatten before reaching a watercourse in units 22A and 3B, and tractor crossings are proposed for use inside class III (intermittent) watercourses during the winter period. 15 road drainage sites are planned for work including rocking, dip construction and culvert repair and replacement. There are 2 goshawk territories within .5 mi of the THP area in section 9, and within .75 mi of the THP area in section 32. An historic (prior to 2004) fisher sighting was reported in section 35, and cascade frogs were reported to be in the East Fork Nelson Creek in section 30. More information is available on the THP Tracking Center website.